The degree of doctor of agricultural sciences awarded by the Faculty Agronomy of the University of Agriculture and Technology in Olsztyn, Poland, in 1979, on the basis of the thesis entitled: "Physiological and biochemical properties of maternally different seeds of pea, faba bean and yellow lupine". The degree of doctor habilitated of agronomy (specialization of plant physiology) awarded in 1986 on the basis of research and publication “Studies on the vigour of legume seeds”, Olsztyn, Poland. The title of professor of agricultural sciences (specialization in plant physiology). Issued by the Central Commission for Academic Degrees and Titles in Poland, 1993. Corresponding Member of the Polish Academy of Sciences since 2004. Research interests in the first issue mainly comprise physiology and biochemistry of seeds in particular in the field of seed vigour. In recent years research has focused on explaining the molecular basis of value in use of legume seeds with special emphasis on the role of raffinose family oligosacharides and galactosyl cyclitols. Carried out research also apply to plant biotechnology in particular molecular seed biology. 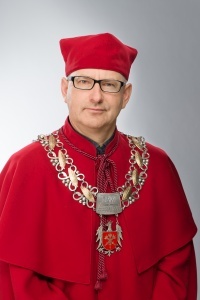 Professor Przyborowski was born on 26 September 1964 in Łasin, , Kujawy and Pomerania Region. He graduated from the University of Agriculture and Technology in Olsztyn in 1988. He received his PhD in 1992 and the degree of doctor habilitated in 2004. Experience: Shortly before graduating, he was employed by the Agricultural Advisory Center of the Institute for Education in Agriculture at the University of Agriculture and Technology in Olsztyn. In February 1989, he assumed the post of assistant trainee at the Genetics and Seed Production Unit of the Department of Plant Breeding and Seed Production. In April 1989, he became enrolled in a doctoral program in biotechnology at the Department of Plant Genetics, Breeding and Biotechnology at the Warsaw University of Life Sciences. In 1992, he joined the Department of Plant Breeding and Seed Production at the Faculty of Environmental Management and Agriculture of the University of Warmia and Mazury in Olsztyn, initially as an assistant lecturer and, subsequently, as a lecturer. Professor Przyborowski currently lectures at the Department of Plant Breeding and Seed Production. He heads the Interdepartmental Plant Biotechnology Laboratory at the Faculty of Environmental Management and Agriculture. Research: crop plant biotechnology (molecular genetics and in vitro plant cultures) and plant breeding. Publications: Professor Przyborowski is the author of 41 original research papers and 23 short communications. He has co-authored one book, two lecture scripts and eight utility models - Salix spp. varieties. 44 citations in the SCOPUS database, h-index (Hirsch index) - 4. Professor Przyborowski has supervised more than ten Master's and Engineer's degree students. He is currently supervising three PhD students. Member of several scientific associations. Awards and distinctions: Bronze Cross of Merit, Team Award of Zielony Feniks Foundation for scientific and research achievements in sustainable energy engineering, eight awards granted by the Rector of UWM. Interests: Classical music, film, theater, hiking. Professor Gornowicz was born on 13 June 1954 in Czersk, Pomerania Region. He graduated from the University of Agriculture and Technology in Olsztyn in 1979. He received his PhD in 1983 and the degree of doctor habilitated in 2004. Experience: After graduation, he took the post of assistant and, later, senior assistant at the Institute of Agricultural Economics and Organization of the Agricultural University in Cracow. He received his PhD from the University of Warmia and Mazury in Olsztyn where he assumed the post of lecturer in 1983. He was a lecturer at the Department of Food Industry Economics and the Department of Microeconomics until 2006. In the 1990s, Professor Gornowicz participated in several medium- and short-term internships in Germany, Denmark and Switzerland. In 2005, he became the head of the Department of Microeconomics, and he was awarded the title of Associate Professor a year later. In 2002-2008, he was the Associate Dean for Part-Time Studies, and in 2008-2012, he was the Dean of the Faculty of Economics. Professor Gornowicz was a member of the university's senate committees for education, development and budget policy. He has been a member of the UWM Senate since 2005. Research: Operating costs, profitability and performance of food processing enterprises, competitiveness of Polish agricultural and food producers on European and global markets. Publications: Professor Gornowicz is the author of around 150 publications, including 70 original research papers, three monographs, 65 conference abstracts and 12 popular science publications. He has supervised two PhD students and reviewed six doctoral dissertations. Membership: Long-term Treasurer and Board Member of the Olsztyn Branch of the Scientific Society for Organization and Management, member of the Polish Economic Society, the Committee of Agricultural Economics and Rural Development of the Polish Academy of Sciences, the Advisory and Program Committee of the National Cooperative Council, policy and research councils of scientific journals. He has chaired the Budget and Financial Committee of the Olsztyn City Council since 2006. Awards and distinctions: More than ten awards granted by the rectors of the University of Agriculture and Technology in Olsztyn and the University of Warmia and Mazury in Olsztyn. Born on 6 June 1964 in Brodnica, Kujawsko-Pomorskie Voivodship. Graduated from ART in Olsztyn in 1989. Doctorate – 1993, habilitation – 2004. Professor of Veterinary Sciences since 2010. His main scientific interests include: pharmacokinetics and pharmacodynamics of antibacterial and anti-inflammatory drugs, immunopharmacology of anti-inflammatory drugs, the effect of bioactive substances on ovary secretory functions and the contractive function of smooth muscles, in silico analysis of veterinary drugs. - Jaroszewski JJ, Hansel W (2000) Intraluteal administration of a nitric oxide synthase blocker stimulates progesterone and oxytocin secretion and prolongs the life span of the bovine corpus luteum. Proceedings of the Society for Experimental Biology and Medicine (currently Experimental Biology and Medicine) 224:50-55. - Jaroszewski JJ, Skarzynski DJ, Blair RM, Hansel W (2003) Influence of nitric oxide on the secretory function of the bovine corpus luteum: dependence on cell composition and cell-to-cell communication. Experimental Biology and Medicine 228:741-748. - Jaroszewski JJ, Bogacki M, Skarzynski DJ (2003) Progesterone production in bovine luteal cells treated with drugs that modulate nitric oxide production. Reproduction 125:389-395. - Skarzynski DJ, Jaroszewski JJ, Bah MM, Deptula KM, Barszczewska B, Gawronska B, Hansel W (2003) Administration of a nitric oxide synthase inhibitor counteracts prostaglandin F2a-induced luteolysis in cattle. Biology of Reproduction 68:1674-1681. - Jaroszewski JJ, Skarzynski DJ, Hansel W (2003) Nitric oxide as a local mediator of prostaglandin F2a-induced regression in bovine corpus luteum: an in vivo study. Experimental Biology and Medicine 228:1057-1062. - Grabowski T, Jaroszewski JJ (2009) Bioavailability of veterinary drugs in vivo and in silico. Journal of Veterinary Pharmacology and Therapeutics 32:249-257. - Maślanka T, Jaroszewski JJ. (2012) In vitro effects of dexamethasone on bovine CD25+CD4+ and CD25-CD4+ cells. Research in Veterinary Science 93(3):1367-79. - Maślanka T, Jaroszewski JJ (2013) In vitro studies on the influence of dexamethasone and meloxicam on bovine WC1+ γδ T cells. Veterinary Immunology and Immunopathology 151(3-4):248-62. - Grabowski T, Jaroszewski JJ, Gad SC, Feder M (2014) Relationship between drug structure and minimal inhibitory concentration value used for acceptable daily intake analysis. International Journal of Toxicology 33(6):490-497. - Ziółkowski H, Grabowski T, Jasiecka A, Zuśka-Prot M, Barski D, Jaroszewski JJ (2015) Pharmacokinetics of oxytetracycline in broiler chickens following different routes of administration. The Veterinary Journal 208:96-98. - Ziółkowski H, Jasiecka A, Zuśka-Prot M, Przybysz J, Grabowski T, Jaroszewski JJ (2016) Metal ion-oxytetracycline pharmacokinetic interactions after oral co-administration in broiler chickens. Poultry Science 95(8):1927-1933. Professor Białuński was born on 2 April 1967 in Giżycko. In 1990, he graduated from the Faculty of History at the Nicolaus Copernicus University in Toruń. He received his PhD in 1996 and the degree of doctor habilitated in 2002 at the Nicolaus Copernicus University in Toruń. He was awarded the title of Professor of Humanities in 2012. Experience: after graduation, Professor Białuński worked as a history teacher, including in Giżycko. Having obtained his PhD degree, he assumed the post of lecturer at Wojciech Kętrzyński Center for Scientific Research in Olsztyn. Associate Professor at the Institute of History and International Relations at the University of Warmia and Mazury in Olsztyn since 2004, head of the Department of Baltic Sea Region History since 2010. In 1999-2010, Professor Białuński lectured at the Private School of Higher Vocational Education in Giżycko (associate professor, head of the Department of Tourism and Recreation from 2001 to 2006). Research: settlement in Masuria, Teutonic Prussia, Ducal Prussia, Medieval and modern history of Prussia. His recent research interests focus on the disappearance of the (Old) Prussian population, in particular the rise and assimilation of knight dynasties of Prussian origin. Publications: Professor Białuński is the author of more than 230 research articles, editorial works and reviews, including nine books. He has supervised two PhD students. Membership: Wojciech Kętrzyński Center for Scientific Research in Olsztyn (Board Member and Vice-President of the History Committee), Pruthenia Association (Board Member), Verein für Familienforschung für Ost- und Westpreussen, Hamburg. Born in 1955 in Włocławek, neurosurgeon, Professor of medical sciences. A graduate of the No. 1 Adam Mickiewicz Secondary School in Olsztyn and of the Medical University of Warsaw. 1974-1980 - Second Faculty of Medicine, Medical University of Warsaw, diploma no. 2. Doctorate 1988 – First Faculty of Medicine, Medical University in Warsaw. Dissertation entitled Treating trigeminal neuralgia by administering glycerol to trigeminal cistern. Habilitation 1994 – First Faculty of Medicine, Medical University in Warsaw. Dissertation entitled Diagnostics and treatment of normal pressure hydrocephalus. European Course of Neurosurgery – (Wrocław, Amsterdam, Rostock, Saragossa, Jerusalem) 1988-1992 completed with an exam passed in Jerusalem in 1992. Scholarship from the British Council and a Scholarship from the University of Southampton – 1990. European Forum of Health Care System Reform – Brussels 1991. 2nd degree specialisation in neurosurgery 1986. 2000-2002 Member of the Supervisory Board Uzdrowisko Świnoujście S.A.
1995-1997 Chief Editor "Gazeta Lekarska"
Vice-Rector of the UWM for Medical Studies and Research since 2016. Rector’s Representative for Medicine Development – since 2012. Head of Laboratory of Stem Cells Research – since 2010. Head of Neurosurgery Clinic – since 2008. Head of Department of Neurology and Neurosurgery – since 2008. Patent application as co-inventor for an invention entitled “A device for measurement of the abduction and adduction force in human fingers” 2015. Patent application as co-inventor for an invention entitled ”A device for determination of the moment of force of reaction of a foot in the ankle axis and a method for determination of the moment of force of reaction of a foot in the ankle axis” 2013. Establishing a foundation for regeneration of nerve cells, 2013. Coordination of the process of preparation and implementation of system transformations in healthcare in Poland in 1997-1999. Establishing (from scratch) the structures of the Chamber of Physicians and Dentists, as secretary to the CPD during the first term. Implementing modern procedures and expanding activities of the Neurosurgery Clinic at the Central Hospital of the Ministry of Internal Affairs in Warsaw (voted the best centre for treatment of brain tumours in the Wprost weekly’s 2004 and 2005 ranking; the Clinic also occupied one of the leading positions as a centre for treatment of discopathies and epilepsy). Author of the handbook entitled “Rudiments of neurosurgery” PZWL 1999. Establishing and running the laboratory of intracranial pressure measurement at the Neurosurgery Clinic of the Medical University of Warsaw 1987-1992. Implementation of the method of epidural spinal stimulation for treatment of spasticity and lower limbs ischaemia and severe angina pectoris. Implementation for use in Poland of percutaneous laser disk decompression (PLDD) as a “minimally invasive” treatment for lumbar disk herniation. Implementation of the Morrell procedure (undercutting the motor cortex in eloquent brain) in treatment of drug-resistant epilepsy. „Czerwona Kokardka” [“Red Ribbon”] – a distinction given by the National Centre for AIDS.